Fast Eddie: You can't see it, can you, Charlie? I mean, you've never been able to see it. I came after him. And I'm gonna get him. I'm goin' with him all the way. The pool game is not over until Minnesota Fats says it's over. Is it over, Fats? Q: Is "The Hustler" based on a book? 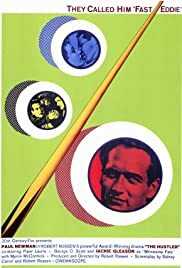 Q: Any recommendation for other pool-playing movies like "The Hustler"? I think "The Hustler" is the best sports movie ever made. Fast Eddie Felson is perhaps the most talented pool shooter in the country and yet, at his core, he's a born loser. Why is Eddie so self-destructive? He has Minnesota Fats, ostensibly the country's greatest player, beaten in the first marathon match only to drink himself into insensibility and let Fats off the hook. Throughout the movie Eddie is surrounded by other people who are self-destructive or only interested in making a buck off of him. Even Charlie, his original manager (Myron McCormick in a terrific role)needs him for a meal ticket. Bert, his second manager, is a slithering, calculating parasite who uses everyone around him. Sara, Eddie's pathetic girlfriend, is going through life in an aimless, alcoholic haze. The movie really lets you into the lives of these people who live on the margins of society. The cinematography is outstanding, the settings and mood of the movie draw you in totally. The acting is uniformly outstanding from top to bottom. Great movies get great performances from the minor characters, too. Vincent Gardenia, Michael Constantine, Murray Hamilton and McCormick are perfect in the smaller roles while Paul Newman, Jackie Gleason, Piper Laurie (all getting well-deserved Oscar nominations) and George C. Scott are indelible in the major roles. Even boxer Jake LaMotta has a cameo as a bartender. Can Eddie finally overcome being a born loser? Can love redeem any of these lost people? What makes a person a champion? Is it talent alone or does a champion need some inner demon that can only be defeated by pursuing victory at all costs?